What Is the Nitrogen Cycling Process in a Saltwater Aquarium? The nitrogen cycle of a marine aquarium (it is essentially the same in freshwater aquariums) is a chain reaction in nature resulting in the birth of various types of nitrifying bacteria, each with their own job to do. Each new bacteria born consumes the previous one, and in turn, gives birth to the next bacteria. The three components involved to make this happen are ammonia (NH³ or NH³+4), nitrite (NO²), and nitrate (NO³). In general, the nitrogen cycling process usually takes about 30 days, but there is no exact time frame for this process to complete its task, as each aquarium is different. Factors such as how many fish, other livestock, and organic matter is present in the tank can vary the completion time, one way or the other. Testing your aquarium water during cycling is very important, as this will tell you what phase the aquarium is in at any given time throughout the process. It should be noted here that there are methods to Speed Up The Nitrogen Cycling Process, some of which can actually cycle the tank in as little as one day. Before explaining how the nitrogen cycling process works, here are a few diagrams and charts you can refer to for a visual aspect first. 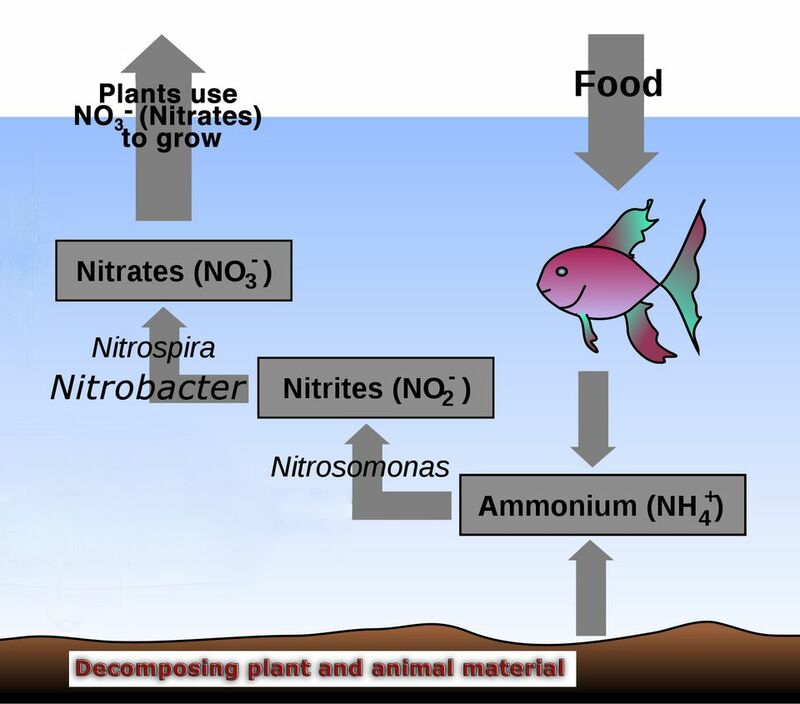 Animated Diagram of the Nitrogen Cycle from Reef Sources. A Typical Break-In Cycle Chart from Aquatics Unlimited. The first component needed in the chain is ammonia, and it is only during the cycling process that elevated ammonia readings should be present in an aquarium. Once ammonia begins to accumulate in the aquarium, the cycling process begins. So where do you get the ammonia from? It is produced by such things as fish and other livestock waste, excess food, and decaying organic matter from both animals and plants. Now putting live animals into a tank for the purpose of cycling is not easy, because they are exposed to highly toxic levels of ammonia and nitrite during the process. However, without ammonia present, the cycle cannot begin, and if ammonia is removed, or the supply is disrupted during cycling, the process stops. As you see the ammonia level rise during the cycling period, if you think by adding an ammonia destroyer or doing a water change to bring it down is helping, it isn't! You are only delaying the cycling process and preventing it from completing its mission. If you use fish to cycle an aquarium, it's a catch 22! You don't want to put the animals in harm's way by exposing them to toxic elements, but you need their waste as the ammonia source to get the job done. The good news is there are alternatives to cycling a new tank without having to use fish, as well as ways to help speed up the nitrogen cycling process. Regardless of what method you use to cycle a new aquarium, the process is the same. Ammonia occurs in two states depending on the water pH. NH³, the unionized state, is more toxic than NH³+4, the ionized state because it can invade the body tissue of marine animals much easier. Almost all free ammonia in sea water with a normal pH is in the ionized state, thus less toxic. As pH rises, the less toxic ionized state decreases and the more toxic unionized state increases. For example, a toxic level of ammonia as NH³ may be present with a pH of 8.4 being lethal, but the same level of ammonia as NH³+4 with a pH of 7.8 may be tolerated. Higher tank temperatures can also affect the toxicity of ammonia. At about ten days into the cycle, the nitrifying bacteria that convert ammonia into nitrite, Nitrosomonas, should begin to appear and build. Just like ammonia, nitrite can be toxic and harmful to marine animals even at lower levels, and without nitrite present, the cycling process cannot complete itself. Nitrite will continue to rise to a high level of about 15 ppm, the most critical stage, and at about day 25 the level should begin to fall off, although it's quite possible to run on for another 10 days. Most likely the nitrite reading will peak and fall off to less than 2 or 3 ppm by about day 30, and shortly thereafter to zero. If it does not, don't worry, it should drop sometime within the next 10 days or so. Now that the ammonia has given birth to nitrite, the nitrite, in turn, give birth to the third and final nitrifying bacteria, nitrobacters. These bacteria are living entities that require oxygen and food (an ammonia source) to survive, grow on the surfaces of everything in the tank, and the waste from nitrobacter are shown in the form of nitrate with a test kit. When nitrate readings begin to increase, you can tell that these beneficial nitrifying bacteria are starting to establish themselves, which is what you have painstakingly been going through the cycling process to achieve.